Created to instill a strong math foundation, the LIFEPAC Kindergarten Math Set is full of fun learning activities. With a focus on the basics of elementary math, two large worktexts in this Alpha Omega curriculum provide colorful instruction and practice in concepts such as counting, comparisons, number order, time, money, addition, and subtraction. Teacher's guide included. Looking for a fun, math workbook for your kindergartener? Try the LIFEPAC Kindergarten Math Student Book 2! Beginning math topics covered include colors, shapes, number order, addition and subtraction, place value, time, and money. Easy-to-follow lessons 81-160, perforated pages, and traceable guide lines are included in this Alpha Omega curriculum. Are you teaching your kindergartener math? Need a comprehensive, step-by-step teacher's guide? Try the LIFEPAC Kindergarten Math Teacher's Guide! This easy-to-follow Alpha Omega curriculum guide has a step-by-step LIFEPAC curriculum overview, lesson planning, objectives, activities, and more. Included are answers for lessons 1-160. Want to teach your first grader math with the LIFEPAC unit worktexts—but don't need the teacher's guides? 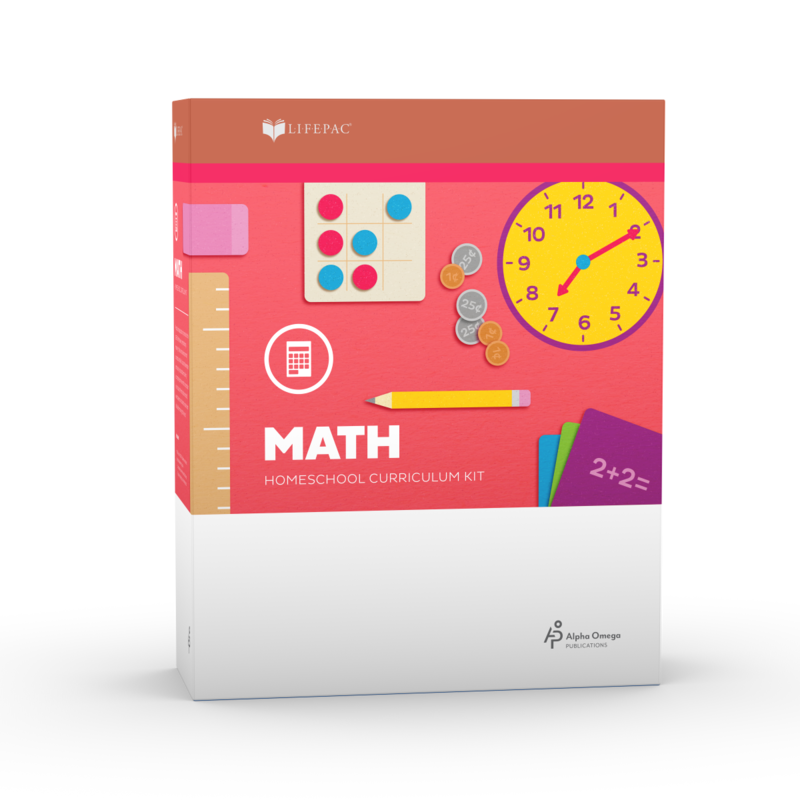 Then get the LIFEPAC 1st Grade Math 10-Unit Set! These ten consumable worktexts include math lessons for one full year. Each worktext in this Alpha Omega curriculum includes full-color lessons, self tests, and a removable teacher-administered test. Are you teaching your first grader math? Need a comprehensive, step-by-step teacher's guide? Try the LIFEPAC 1st Grade Math Teacher's Guide Part 1! This easy-to-follow guide has an Alpha Omega curriculum overview, lesson planning, activities, manipulative ideas, and more. Included are answers for lessons and tests in Units 1-5. Are you struggling teaching your first grader math? Need a step-by-step teacher's guide to help you along? Try the LIFEPAC 1st Grade Math Teacher's Guide Part 2! This easy-to-follow guide has an Alpha Omega curriculum overview, lesson planning, activities, manipulative ideas, and more. Included are answers for lessons and tests in Units 6-10. Ready to teach your first grader math? Try the LIFEPAC 1st Grade Math Unit 1 Worktext! This colorful, consumable booklet will help introduce your student to fundamental math concepts! Topics include counting and writing numbers to 99, adding and subtracting to 9, measurement, shapes, and more. Five sections and self tests are included. Is your first grader ready to review math? Than get the LIFEPAC 1st Grade Math Unit 10 Worktext! This bright, consumable booklet will help solidify lessons learned throughout the year. Topics cover counting to 200, adding and subtracting, story problems, charts, graphs, fractions, and time. Five sections and self tests are included. Is your first grader ready to learn adding and subtracting? Try the LIFEPAC 1st Grade Math Unit 2 Worktext! This colorful, consumable booklet helps introduce your student to fundamental math concepts! Topics cover addition and subtraction to 10, place value, number order to 99, and more. Five sections and self tests are included. Can your first grader read clocks and understand time? Using the LIFEPAC 1st Grade Math Unit 3 Worktext, he will! This colorful booklet helps introduce your student to important math concepts! Topics covered are fractions, story problems, time and symbols, and oral directions. Five sections and self tests are included. Can your first grader count money and add numbers in the teens? If not, then try the LIFEPAC 1st Grade Math Unit 4 Worktext! This colorful booklet helps introduce your student to foundational math concepts! Topics covered are adding to 18, skip-counting, even and odd numbers, money, and more. Five sections and self tests are included. Does your first grader struggle with number order or place value? Then try the LIFEPAC 1st Grade Math Unit 5 Worktext! This colorful, consumable booklet will help introduce your student to these essential math concepts! Topics in this Alpha Omega curriculum are addition, number sequence, greater than/less than, and estimation. Five sections and self tests are included. Does your first grader know how to add two digit numbers? With the LIFEPAC 1st Grade Math Unit 6 Worktext, he will! This bright, consumable booklet will help introduce your student to important math concepts! Topics in this Alpha Omega curriculum are writing number words to 99, operation symbols, story problems, and money. Five sections and self tests are included. Ready to teach your first grader numbers in the 100s? Try the LIFEPAC 1st Grade Math Unit 7 Worktext! This bright booklet introduces your student to valuable math concepts! Topics in this AOP curriculum cover counting numbers to 200, ordinal numbers, subtracting to 12, operation signs, and more. Five sections and self tests are included. Does your first grader know how to add two digit numbers? With the LIFEPAC 1st Grade Math Unit 6 Worktext, he will! This bright booklet introduces your student to important math concepts! This AOP curriculum covers topics like writing number words to 99, operation symbols, story problems, and money. Five sections and self tests are included. Teach your first grader two-digit numbers the fun way with LIFEPAC 1st Grade Math Unit 9 Worktext! This bright booklet helps introduce your student to essential math concepts. This AOP curriculum teaches topics like number words, graphs, place value, fractions, subtracting and adding two-digit numbers. Five sections and self tests are included. 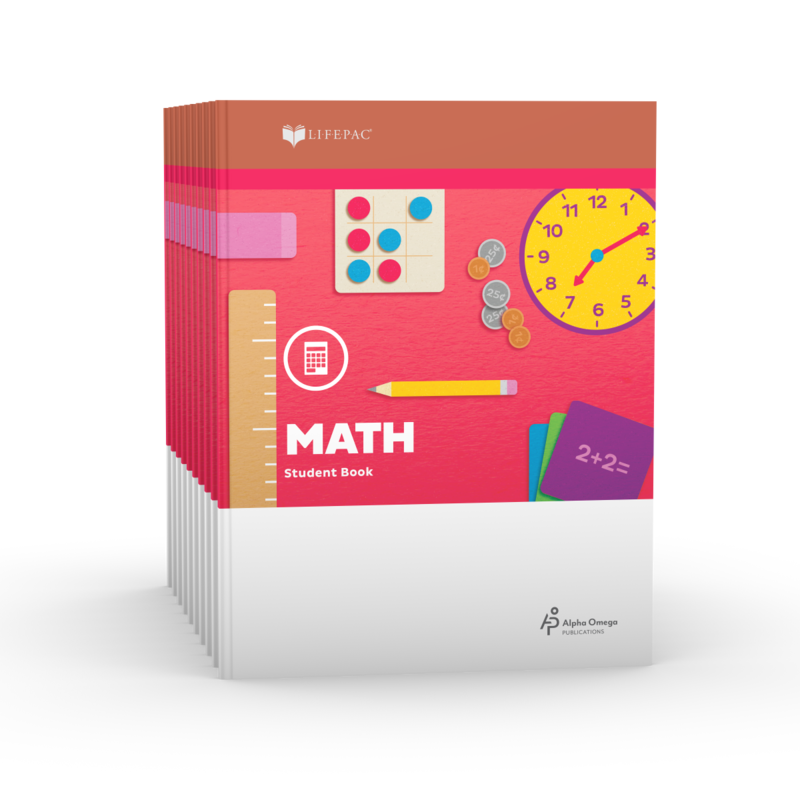 Ready to teach your second grader Math with the LIFEPAC program—but don't need the teacher's guide? Try the LIFEPAC 2nd Grade Math 10-Unit Set! These ten consumable worktexts provide math lessons for an entire year. Each worktext in this Alpha Omega curriculum includes full-color lessons, self tests, and a removable teacher-administered test. Created to encourage a strong math foundation, the LIFEPAC 2nd Grade Math Set is filled with fun learning activities. Ten colorful worktexts in this Alpha Omega curriculum focus on the basics of elementary math, providing instruction in numbers to 1,000, operation symbols, measurements, shapes, rounding, addition, subtraction, time, estimation, and fractions. Are you ready to start using LIFEPAC 2nd Grade Math with your child? Need a step-by-step teacher's guide? Try LIFEPAC 2nd Grade Math Teacher's Guide. This Alpha Omega curriculum guide offers a LIFEPAC curriculum overview, lesson objectives, and extra activities. Detailed teaching notes for each unit and complete answer keys are also included. Created to encourage a strong math foundation, LIFEPAC 2nd Grade Math Unit 1 Worktext is filled with mastery-based learning. Concentrating on laying the groundwork for more difficult math skills, this Alpha Omega curriculum provides a review of many first grade math concepts, such as numbers, number words, and place value. Fun, mastery-based learning is what you'll find in the LIFEPAC 2nd Grade Math Unit 10 Worktext. Concentrating on laying the groundwork for more difficult skills, this child-friendly, colorful worktext will make learning math more fun for you and your child. This Alpha Omega curriculum provides instruction in basic arithmetic concepts. Fun, mastery-based learning is what you'll find in the LIFEPAC 2nd Grade Math Unit 2 Worktext. Concentrating on laying the groundwork for more difficult skills, this child-friendly, colorful worktext will make learning math more fun for you and your child. This Alpha Omega curriculum provides instruction in basic arithmetic concepts. 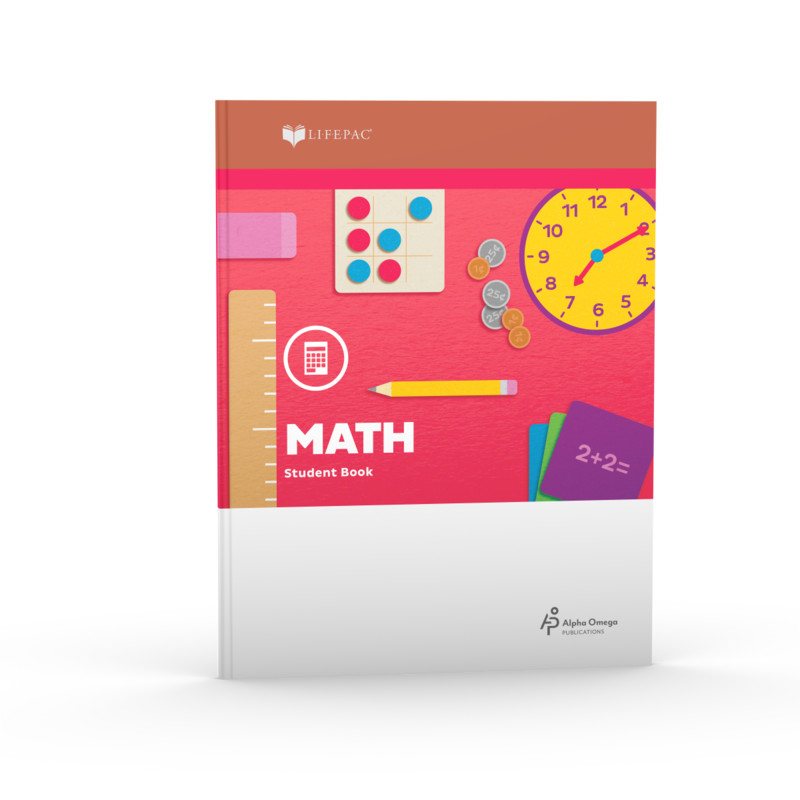 Based on mastery learning methods, LIFEPAC 2nd Grade Math Unit 3 Worktext encourages a strong math foundation in your child. Concentrating on laying the groundwork for increasingly difficult math concepts, this Alpha Omega curriculum focuses on elementary math skills such as addition with carrying, subtracting, rounding, and much more.